I only had a chance to interview Sally Ride once. It was a TCEA in Austin, Texas. They have a sort of press room set up there, and I waited my turn to speak with her—along with others. As it turned out, I’d be last, so it gave me a chance to listen to all the questions and her responses. None of the questions were about education, and I don’t think any of the others had done their homework on that side of Sally Ride. There were the repeated astronaut, and first American woman in space questions—over and over again, as well as a weird one about tennis, because she had played, but nothing about education. When my turn came, Sally and I really owned the room. She looked at me, expecting the same line of questioning. She sort of had that “here we go again” look. I began by telling her about how my science students visited NASA in Florida as part of a yearly-earned trip. How they listened to her recorded voice on the bus guiding us at NASA. I also shared that what she had done and said wasn’t lost on my girls, as evidenced in all the mentions of Sally Ride in their trip journals—and follow-up reports. I think the smile appeared somewhere during that introduction. We had a nice conversation. I really can’t call it an interview. While I may have mentioned her Challenger experience, I don’t think we talked physics. She was as interested in hearing about my students and what I’d done in the science classroom as I was interested in hearing about summer science programs for girls, and her thoughts to get more girls into science careers. That journey wasn’t an easy one for her, so it really was her mission. We spent a long time talking—just the two of us in that room—while the TCEA exhibit hall buzzed below. I know that everyone will be talking about Sally Ride as the first American woman in space, but I’m thinking many girls found science, math, and space interesting because of her. 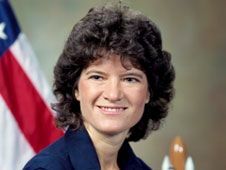 And her legacy may be in the many that will continue to make that discovery in the programs she helped to develop with Sally Ride Science. I know that my memory of her has nothing to do with a space suit, and everything to do with the person, and a winter conversation about science and education.